The deadly attack may make a military base in neighboring Djibouti even more attractive for Beijing. Somalia’s president, Hassan Sheikh Mohamud, also condemned the “callous” attack, which he attributed to terrorist “gangsters and conmen.” Mohamud vowed that “the Jazeera Palace will be rebuilt and it will soon be back in business.” AFP reported that the “hotel was torn apart by the explosion,” with one side demolished. According to al-Shabaab, the attack was launched in retaliation for an offensive last week designed to drive militants out of southern Somalia. Somalian, Ethiopian, and Kenyan forces were involved in the joint effort, as was the African Union’s peacekeeping force in Somalia (AMISOM). Al-Shabaab said the attack on the Jazeera Palace Hotel was “in retaliation for the killing of dozens of innocent civilians” during the offensive. 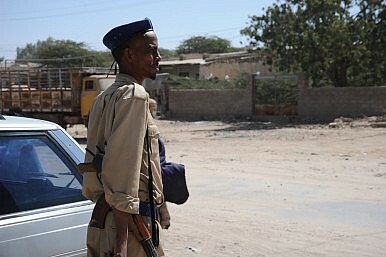 China’s embassy in Somalia was closed from 1991 until October 2014, due to instability and violence in the country. Like other nations, China handled relations with Somalia through an embassy based in Kenya. However, China grew cautiously optimistic about Somalia’s security situation after 2012, eventually announcing in July 2014 that it would reopen its embassy in Mogadishu. The tragedy of July 26 demonstrates how far Somalia has to go before it can ensure the safety not only of its citizens, but of foreign diplomats in the country. In the wake of the attack, China’s Foreign Ministry promised to “step up security precaution [sic] and protect the security and interests of Chinese institutions and personnel in Somalia.” For those in China who argue for a more robust military presence around the globe, the embassy attack is another telling reminder of how China’s interests around the globe have outstripped its capabilities to protect those interests militarily. With recent unrest impacting Chinese citizens in Somalia as well as Yemen, China’s government may be taking a closer look at the possibility of setting up a military base in Djibouti. A base there would provide a strategic location on the Horn of Africa for Chinese troops and military assets. After 23 Years, China to Reopen Embassy in SomaliaChina Officially Sets Up Its First Overseas Base in DjiboutiChina Rejects Accusations of Stonewalling Climate TalksUS General: China Has 10 Year Contract for First Overseas Military BaseIs China Ready to Be a Global Power?